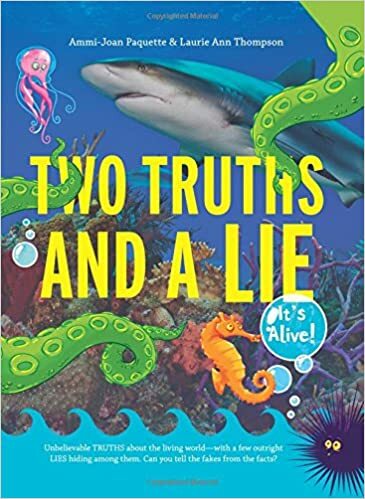 Summary: “Two truths and a lie” used to be a dinnertime staple in our family, as I tried to ensnare my hapless young children into believing a convincing-sounding falsehood about my day. The co-authors of the first entry in this series use their powers for good, telling three brief tales from the natural world, only two of which are true. For instance, in the first section, there are stories about a plant whose roots sometimes resemble a person, a forest whose trees all sprout from the same root system, and the secret lives of plants (how they learn and communicate). Turn to the back to learn that the first one is false, although it’s based on pictures that can be found on the Internet. Other chapters delve more into plants, then move on to animals and humans. These authors are serious about doing good research, as they include a research guide and a 17-page bibliography. Also includes an index. 176 pages; grades 3-7. Two pros and a con: This is a great resource to use to encourage critical thinking, particularly about what can be found on the Internet. Both the writing style and illustrations are easygoing and engaging. The story about the headless chicken that lived for years is just gross, although (spoiler alert) true.